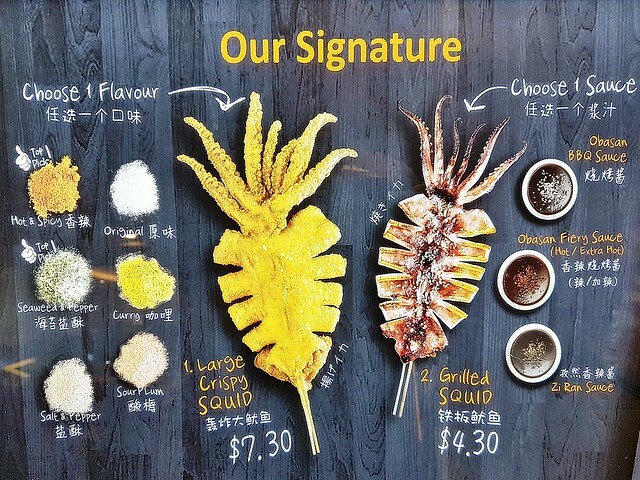 Founded as a pop-up kiosk named Encik Sotong in June 2015 by Timothy Ho, the brand was renamed to Uyi Savoury Squids in August 2015 when they opened their 1st permanent stall in Bugis Junction. Officially receiving their halal certification in January 2016, Uyi Savoury Squids (pronounced 'Woo-Yi') has grown even more popular. 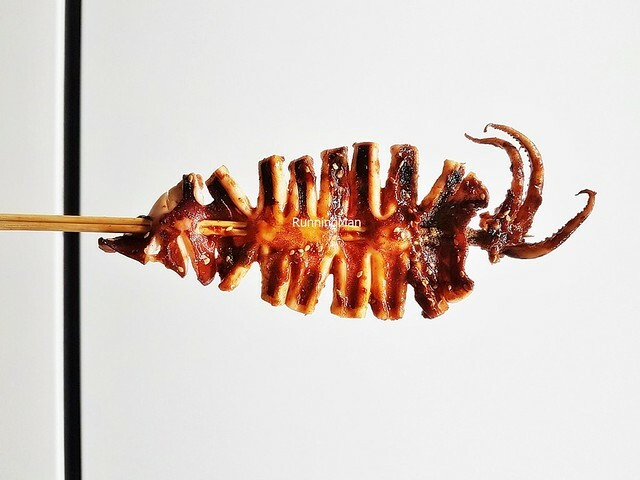 They are well known for their large, perfectly fried or grilled squid, which are larger than most people's faces! Ambience at Uyi Savoury Squids is limited, as it's a takeaway type of stall. 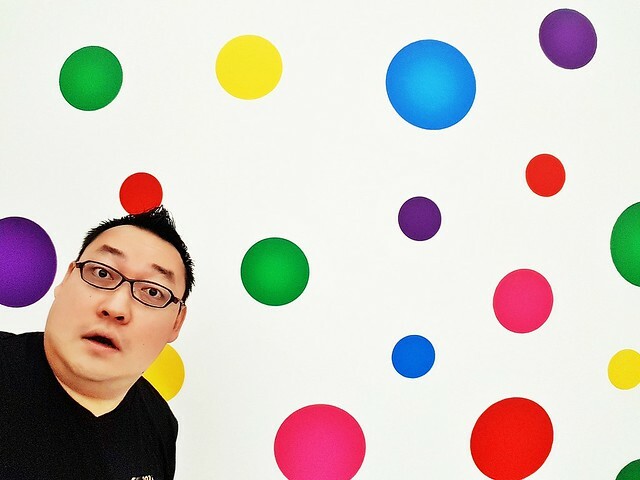 However, it's usually brightly lit, open, clean, and feature eye-catching signage that can be seen from afar. Part of their appeal is the open kitchen, where you can watch the staff frying or grilling the succulent squid for you. 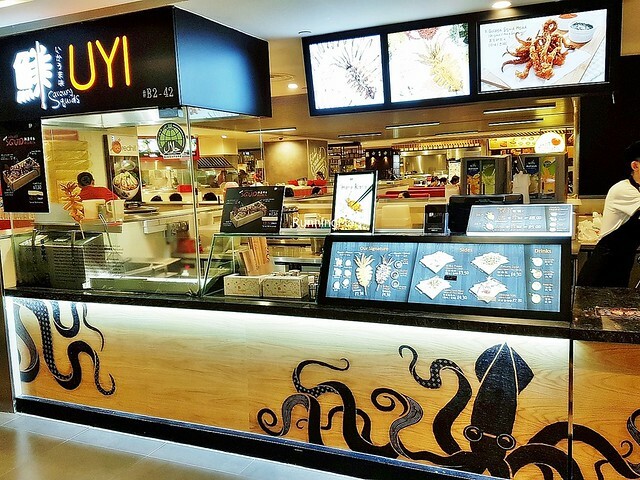 Service at Uyi Savoury Squids is completely self-service, with ordering, payment, and collection of orders over the counter. There is usually a short waiting time of 5 minutes or so for your food to be prepared. Staff are courteous, and display decent product knowledge on the range of seasonings and toppings. Food at Uyi Savoury Squids is all about seafood, in particular, squid. Besides being halal-certified, they have consistently good quality in their squid. 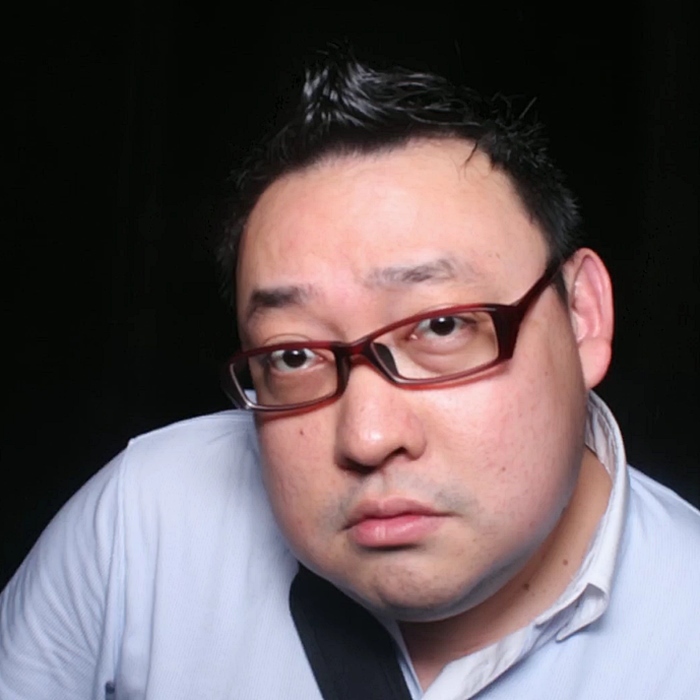 The recipes for their delicious seasonings and sauces, as well as the cooking techniques to achieve a perfect texture, are taught by Head Chef Masahiro Tanaka, who train each staff for 1 month. The squid itself is sourced wild, from Yobuko, in Saga Prefecture, Kyushu island of Japan. Portions are large, more than sufficient for individuals. Prices are slightly high for street food, but you also get high quality, making it good value for money. Budget about SGD $8 for a snack here. 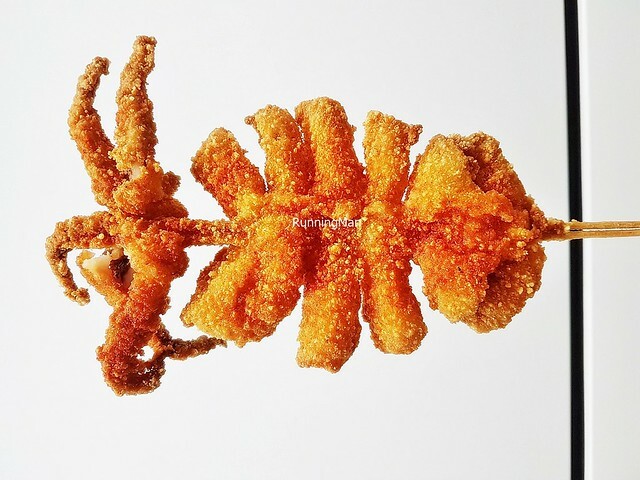 The signature Crispy Squid, Hot & Spicy (SGD $7.30) has a light, crisp, golden batter which crunches satisfiyingly. 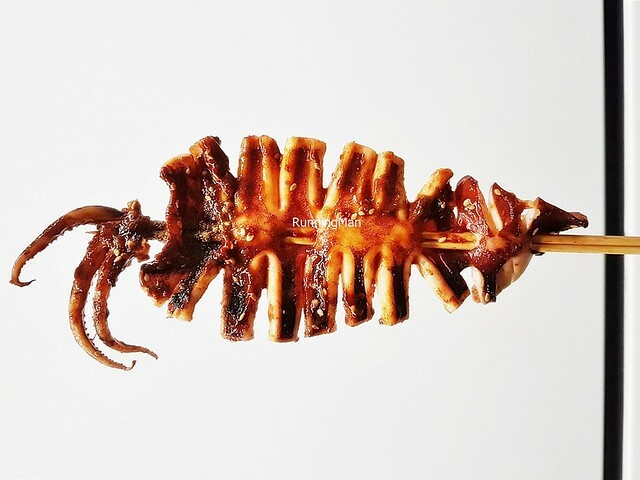 Yet the squid within is still bouncy chewy tender in texture, with a delicate sweet savoury flavour. The hot and spicy seasoning powder lends a spicy kick, sharp but it fades quickly, without any lingering burn. Highly recommended! 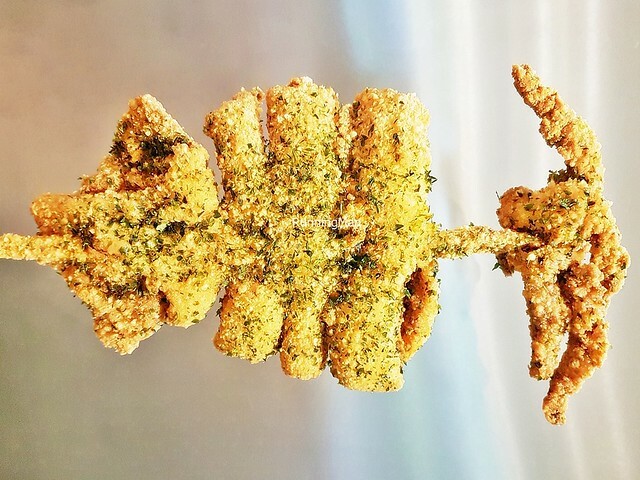 Another popular flavour is the Crispy Squid, Seaweed & Pepper (SGD $7.30). 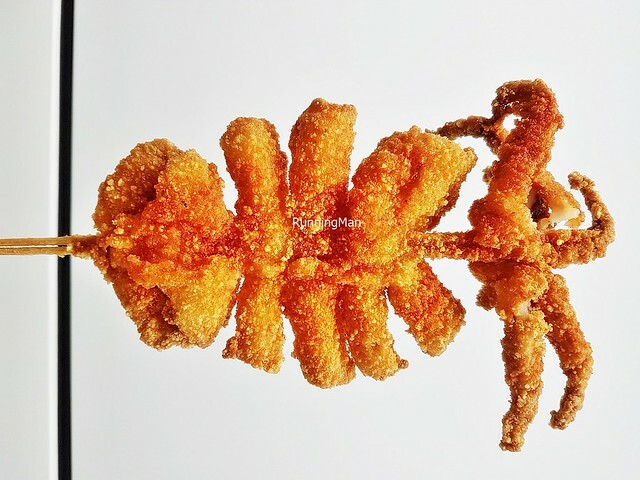 With the same light, crisp, golden batter which crunches satisfiyingly, the squid has that bouncy chewy texture, with a delicate sweet savoury flavour. The difference is the seaweed and pepper seasoning powder, which lends a deeply earthy vegetal peppery flavour. The squid I was served here wasn't skewered properly, resulting in part of it falling off the skewer. The signature Grilled Squid, Zi Ran (SGD $4.30) has a lovely bouncy chewy tender texture, and it's not dry. Flavour of the squid is fresh and delicate with notes of sweet savoury, and the zi ran sauce lends a mildly spicy, boldly sweet taste. A little messy to consume, you'll have to eat this carefully. Still, a delicious treat. Highly recommended! 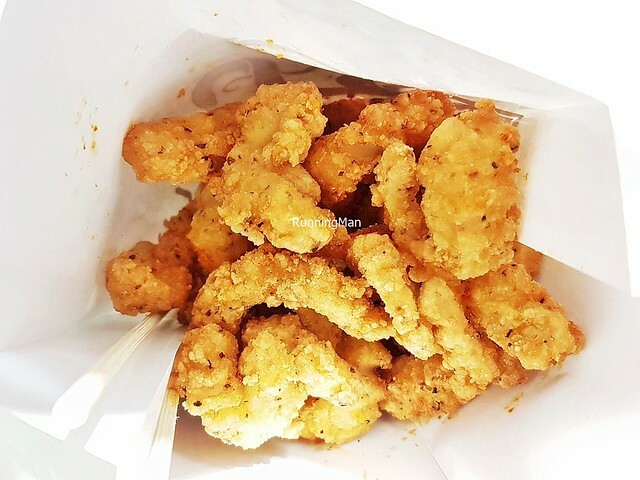 For a lighter snack, get the Popcorn Squid, Salt & Pepper (SGD $3.80). This has fresh, bouncy sweet chunks of squid, tightly coated in a crisp golden batter, with a light sprinkling of salt and pepper. Has an appetizing taste that makes you crave more. Good! 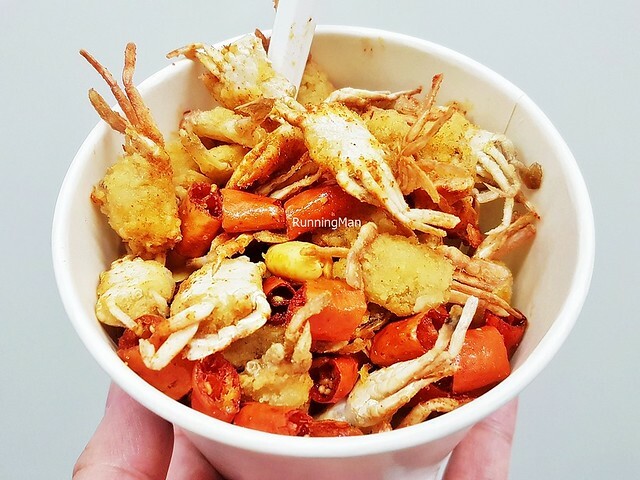 The Mini Kani (SGD $6.80) features a generous portion of whole, mini soft-shell crabs, deep-fried till crisp. 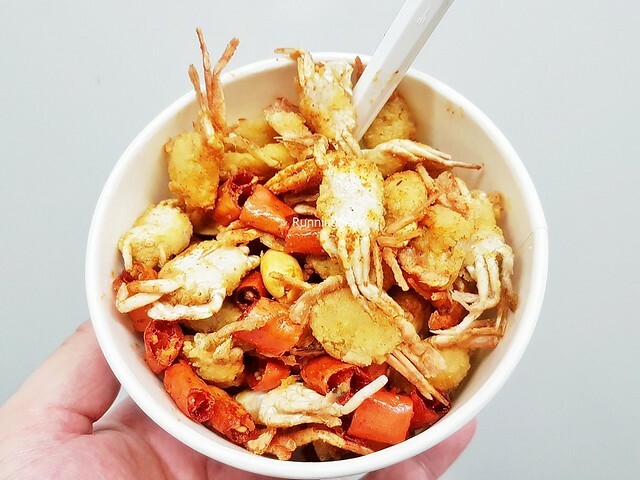 The entire mini soft-shell crabs can be eaten, texture is crispy and crunchy on the outside, airy and fluffy on the inside. Garnished with hot and spicy seasoning powder, dried red chili, and roasted peanuts, this addictive snack has notes of sweet savoury salty spicy. Best shared, as it's rather decadent.